What do you do when you have a baby that needs to eat food but is protesting being in a high chair? Every piece of food I gave him, he promptly picked up and threw on the floor. Some he would even get my hopes up by putting them in his mouth, but that would be quickly followed by spitting it back out and throwing it on the floor. I knew if he didn't eat dinner then he would be awake in the middle of the night starving, and that's no good for anyone! 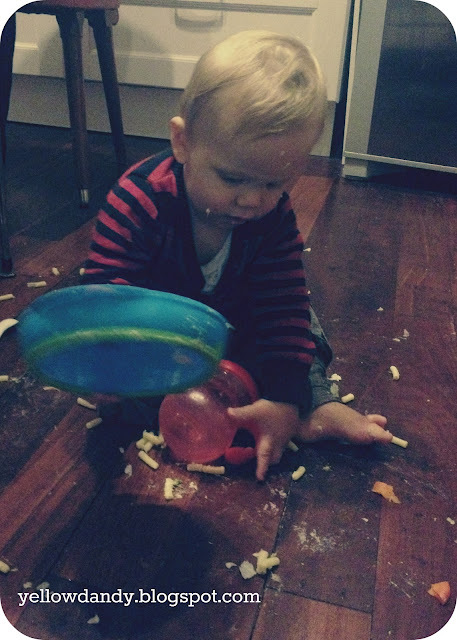 I don't usually do this, I've never felt the need to before, but last night I let Ez eat dinner off the floor. 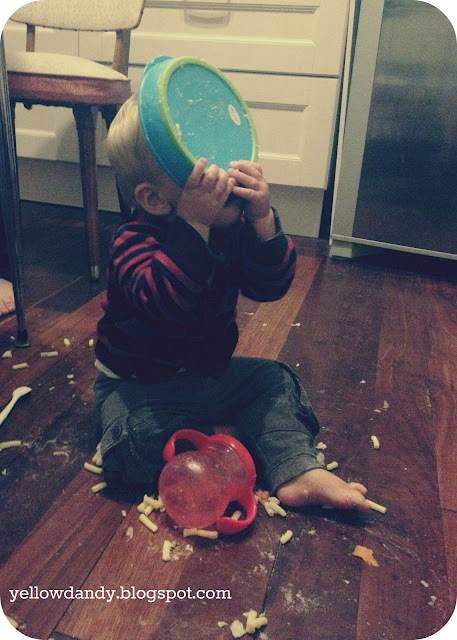 I took the kid out of his high chair, and placed him on the wood floor, gave him a bowl of homemade macaroni, cheese sauce and vegetables, and let him go to town. I felt kinda weird putting his bowl on the floor, like I do for the dog (Angus). Joel and I gave each other awkward, 'I hope this is alright', kinda looks. It felt a little bit wrong. But, it worked. He promptly started grabbing all the food and shovelling it into his mouth. He even started looking for more, so he got another bowlful. He doesn't understand yet the purpose of a bowl, because he pretty much just tipped it all out and ate it off the floor. Sometimes he would smash it with his foot, and then eat it. You know just Incase it hadn't gotten all the floor germs on it! Clean up was made easy by a dutiful dog, licking the floor until it was shiny and sort of clean, I mean apart from all the dog drool. He is getting so independent, he hates eating anything but yoghurt from a spoon. He wants to do everything himself. He is so desperate to walk he practices at every waking moment, he likes to eat his food standing up holding himself up with the high chair leg. My baby is growing up. I'm so happy when he reaches all these new milestones, but it is kind of sad to think that little baby is growing up so fast. I hope this is just a phase because his gums are hurting with some more teeth making their way through. I really don't want to have my child eating his food off the floor. I guess you just do what you gotta do right? Any tips from experienced Mums on whats worked for you? 5 comments on "Please don't become a regular thing"
I enjoyed this story (AND the pics!) We still typically have Aubrey in her high chair (at 2.5 - sad, I know) and she STILL throws food on the floor. It's something I've always struggled with, especially being the clean freak that I am. I guess Roxy isn't an expert cleaner upperer! I hear boys are messier and grosser than girls, so you might have to prepare for that too! Yeah we just laugh, it is all you can do really!! I'll let you know if I figure out any solutions!! ohKaren this made me laugh! I don't have any advice sorry except try to keep a sense of humour about it all. I'm sure you will sll find your way. I look forward to seeing what advice you do get as I am sure I will face the same problem one day soon! Dear Karen, your post made me laugh( quietly because my little man is asleep next to me) oh that's so true! My little man loves to eat off the floor! I've had to stop caring about germs:) in fact I read somewhere that it's good to put out a muffin tray of little snacks that your toddler can graze on all day, and guess what? They go straight in the floor, and he'll come back and eat them when he likes.